When analysts attempt to make sense of data on North Korea, confusion is often the order of the day. This year has been no exception. International aid agencies claim that a major drought has fomented a now-dire food shortage in the country, but in truth, the numbers don’t seem to indicate that things are any worse than normal. Agricultural reforms may be helping to alleviate some pain from the drought, but the new policies certainly don’t seem to be working miracles. Let’s recap the developments over the past few months. First, the drought swept across the Korean peninsula in the first half of this year, prompting calls for global action from North Korean authorities and international aid agencies. The DPRK, for its part, predicted the drought would be the worst in a century and lead to extensive food shortfalls. However, after a couple of months, aid agencies started to sound the alarm bells again. In October, the Food and Agriculture Agency of the United Nations (FAO) said that bad weather conditions could cause North Korea’s staple food production to plummet by 14 percent this year. According to the UN forecast, North Korea would produce 3.7 million tons of rice and corn in total this year, down from 4.3 million tons last year. Factoring in imports of about 500,000 tons, the FAO predicted a shortfall of 1.2 million tons in total. However, as seasoned North Korea watcher Marcus Noland argues, observers may have overstated current levels of food insecurity in the DPRK. The current production figures are simply in line with normal conditions, and last year’s figures were unusually high. Some reports from inside North Korea seem to align with the more optimistic narrative. 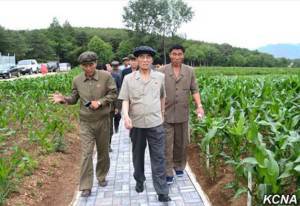 Daily NK reported on November 26 that small-plot farmers—that is, not the collective farms—have had a very good year. According to the report, the main reason for the strong harvests was not exclusively agricultural reform, but the availability of motorized water pumps and water turbines for irrigation. It is questionable whether this can really tilt harvests one way or the other. After all, the amount of North Korean farmers with means to purchase pumps and fuel is probably pretty low. But stories like this are important reminders of the multitude of factors that impact food production. To better understand what is really going on, we must consider several questions. How bad was the impact of the drought? How does this year’s food situation compare with that of the last few years? Do agricultural reforms seem to matter? How Bad Was The Drought? The drought was not as bad as observers had feared, but that does not mean it did not matter. An FAO assessment from September this year claimed that early-season production of wheat and barley declined by 30 percent from last year, and the early-season potato yield was 20 percent smaller than in 2014. The rice bowl provinces of North and South Hwanghae were hit hardest by the lack of rain. Fortunately for food production, this year’s flooding damage was mostly a local phenomenon in the country’s north; only 700 hectares were adversely affected. The FAO brief does not give an outright estimate of this season’s harvest, but subtracting the import requirement (421,000 tons) from the estimated need (5.49 million tons) gives an estimated total production of around 5.07 tons, in milled cereal equivalent terms. These are only very preliminary “guesstimates”, but are likely indicative of the current situation.. It is important to remember that Public Distribution System (PDS) food rations do not represent the whole story, as most North Koreans probably rely on markets for a very significant part of their food consumption. Most survey studies indicate that the majority of food people consume comes from the markets and from other private sources, like kitchen gardens. In addition, there are likely to be disparities in food access between populations in different regions and in urban and rural areas. For example, the FAO recently estimated that the proportion of underweight children is twice as large in the countryside as it is in the cities. Vulnerable segments of the population are more dependent on the PDS, and thus more likely than the average citizen to be adversely impacted when harvests decline. This year’s malnutrition figures are indeed dire, even though malnutrition has been improving since the late 1990s. The absolute number of undernourished people is expected to increase in the 2014-2016 period, though they would represent a slightly smaller portion of the overall population than in 2010-2012. As the FAO notes in its yearly report: “The only major exception to overall favourable progress in the region is the Democratic People’s Republic of Korea, which is burdened by continuously high levels of undernourishment and shows little prospect of addressing its problems any time soon.” However, the proportion of undernourishment appears to be going down, so the trend still seems possible even though the situation is not stable. The impacts of the drought seem to have been far milder than expected, but they are still significant. In order to fully understand North Korea’s current food situation, we need to view it in the context of the past few years. How Does This Year’s Food Situation Compare to Previous Years? This year’s decline in food production is not unusual. This past February, the FAO estimated that North Korea’s harvests had stagnated in 2014, reversing a trend of production increases that began in 2010. In that year, harvests went up by a modest 3 percent. In 2011, harvests increased by 8 percent, followed by a 10 percent increase in 2012. In 2013, the assessment team of the FAO and the World Food Programme noted an increase for the third year in a row, something that hadn’t occurred for many years. Sources: Food and Agriculture Organization and author’s own calculation. The 2015/2016 figure is a rough estimate based on North Korea’s output versus its need as preliminarily projected by the FAO. All figures are expressed as cereal equivalent numbers of harvests. We see a pattern of relatively wide swings over the past few years. The trend between 2010/2011 and 2013/2014 was one of growth, but those increases ended in 2014/2015. Seen in this context, this year’s harvest does not seem unusually bad, though all available figures are uncertain estimates. Some experts were quick to claim that agricultural reforms implemented under Kim Jong Un were responsible for the harvest increases of the past few years. The overall pattern, however, calls that idea into question. The most consistent factor seems to be the weather. Record years like 2013 saw unusually good weather, which is important to keep in mind when some claim that harvests increased as a result of agricultural reforms. In 2014, when harvests began to decline again, dry spells struck the country and precipitation was unusually low in the winter. North Korea was struck by a drought in 2012 too, but irrigation efforts partially mitigated its impact. This pattern highlights how vulnerable North Korea remains to weather changes, despite efforts to boost its resilience. In sum, recent harvest yields show that while the drought seems to have caused a decline in food production, it is nowhere near the dire pre-2010 figures. One source with special insight into the situation on the ground in North Korea suggested to 38 North that the additional appeals from multilateral agencies this year may have more to do with donor fatigue than with the production decline. The short answer is: it is hard to tell. It is possible that the reforms increased agricultural efficiency and partially compensated for the effects of the drought. In other words, food production may have decreased, but it would have been worse had the reforms not been implemented. It is worth remembering that neither the extent nor the content of the reforms is fully known. Instead, information remains anecdotal at best. Many of the claims about the success of the reforms seem to rest on anecdotal information from people who have visited collective farms in North Korea. For example, one source in frequent contact with aid workers visiting the country told 38 North that when a Western delegation visited a farm, officials told them that agricultural reforms were being implemented with success, counterbalancing some of the loss caused by this year’s drought. Such claims may very well be true, but without knowing how widely reforms have been implemented—they started out on an experimental basis in some localities—it is impossible to even “guesstimate” their full impact. The past increase in food production also predated any agricultural reforms, calling into question whether policy changes have had a noticeable positive impact. Again, the weather seems to be the most important factor. Reforms were supposedly introduced in 2012, but by then, agricultural production had already been on the rise for several years. Foreign media outlets have closely associated the reforms with the rule of Kim Jong Un, so the North Korean regime may have touted the supposed success of the reforms partially to avoid undermining the leader’s authority. As is often the case with North Korea, these pressing questions lack clear-cut answers. The country seems to have been badly hit by the drought, but food production is still better than it has been in past years. The weather seems to be one of the most important factors for the fluctuations in food production. Agricultural reforms may have a marginal impact, but the unsatisfying truth is that we simply don’t yet know their effect. Food and Agriculture Organization/World Food Programme, FAO/WFP Crop and Food Security Assessment Mission to the Democratic People’s Republic of Korea, Rome: FAO/WFP, 2008, http://www.fao.org/docrep/011/ai475e/ai475e00.htm. Food and Agriculture Organization/World Food Programme, FAO/WFP Crop and Food Security Assessment Mission to the Democratic People’s Republic of Korea, Rome: FAO/WFP, 2012,http://documents.wfp.org/stellent/groups/public/documents/ena/wfp252385.pdf. Food and Agriculture Organization/World Food Programme, FAO/WFP Crop and Food Security Assessment Mission to the Democratic People’s Republic of Korea, Rome: FAO/WFP, 2013,http://documents.wfp.org/stellent/groups/public/documents/ena/wfp261353.pdf. Food and Agriculture Organization, The Democratic People’s Republic of Korea: Outlook for Food Supply and Demand in 2014/15 (November/October), February 3, 2015, http://www.fao.org/giews/english/shortnews/20150203DPRK.pdf. This figure is based on the author’s own calculations using the figures given in the September 2015 FAO country brief. It is based on the following calculation: Estimated need (5.49 million tons) minus total import need (421,000 tons) = 5.069 million tons. See Food and Agriculture Organization (FAO) and Global Information and Early Warning System on Food and Agriculture (GIEWS), “GIEWS Country Brief: Democratic People’s Republic of Korea.” 9 September, 2015. Accessed 19 November, 2015, http://reliefweb.int/sites/reliefweb.int/files/resources/PRK_6.pdf.